I grew up watching my dad catch and cook snapper on barbecues made with cypress pine which smelled divine as it burned. He’d brush on his special mix of lemon juice and olive oil that would splatter onto the white-hot ashes sending smoke up through the meat. He was famous among family and friends for his BBQ fish and over the years his monster cook-offs would come to include thick discs of chorizo, pork chops and perfectly charred olive oil and garlic ciabatta. It’s rather surprising that it took me more than five years of living in UK before I finally bought my own BBQ. After careful market analysis I decided on a Dancook Charcoal 7300; simple and perfectly designed for my needs – which is a flat surface for hot stuff and solid, moveable grill for the food. You might as well know I don’t consider gas-flame cooking as BBQ; if it’s not smokin’, if your face ain’t sweatin’ and your hands ain’t burnin’ then I’m not interested. My kitchen faces north-west which makes it a veritable oven in summer, so I like to keep the heat outside whenever I can. 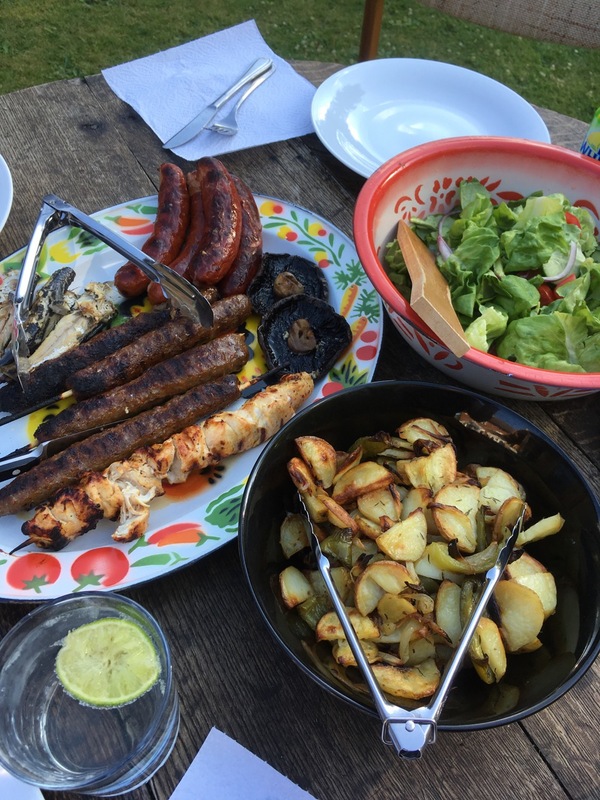 We’ve been firing up steaks and pork-neck skewers but last weekend we pulled out all the stops and set up a table in the shade of the garden and tried a variety of bits and pieces. 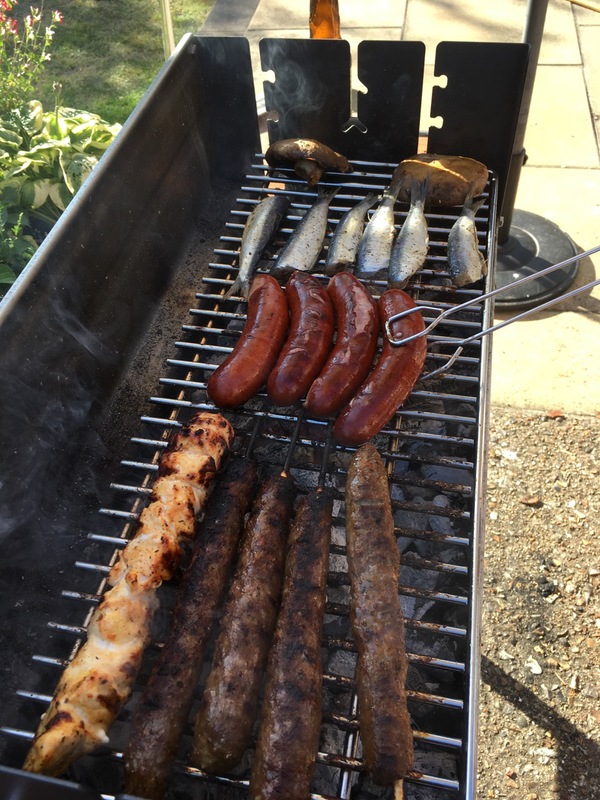 I get my pork and incredible kransky-style sausages from the Polish deli in Maidenhead, I found some Cornish sardines in Sainsbury’s and saw Ged Cowdrey in Cookham for some marinated specialities like sweet-minted lamb kofta and honey-ginger chicken. We brushed up a few slices of day-old baguette to make our own garlic and olive oil toast and for good measure I threw on a few large, flat mushrooms seasoned with plenty of salt and pepper. In this heat, my motivate and my appetite wanes, and so I kept the sides low-fuss with a simple salad and my new favourite potato dish. 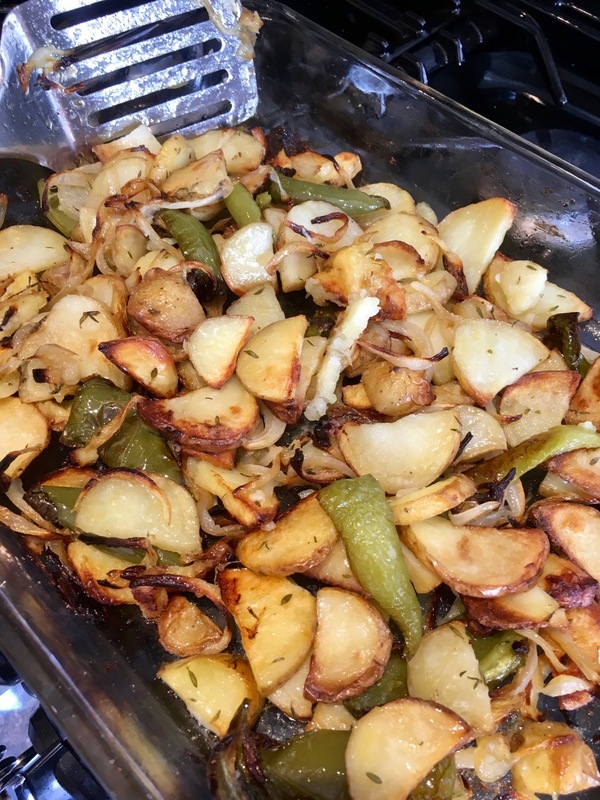 Thinly slice some Maris Piper potatoes, and toss them with roughly sliced green peppers, onions, fresh thyme and plenty of olive oil and salt. Bake in a moderate oven for an hour and you’ll be amazed at the aroma that fills your kitchen and the incredible sweetness of the roasted onion slices combined with savoury kick of green peppers. I don’t know about you, but this is how we do BBQ.